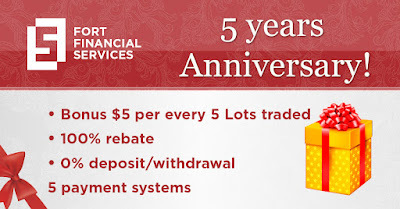 FORT FINANCIAL SERVICES «5 YEARS ANNIVERSARY»! Free deposits and withdrawals - commission compensation on deposits and withdrawals for 5 payment systems (Skrill, Neteller, WebMoney, SorexPay, SafeCharge). Bonus of 5 USD for every 5 lots traded - for every 5 standard lots traded, the account is credited with a bonus of 5 USD or equivalent in other currencies. 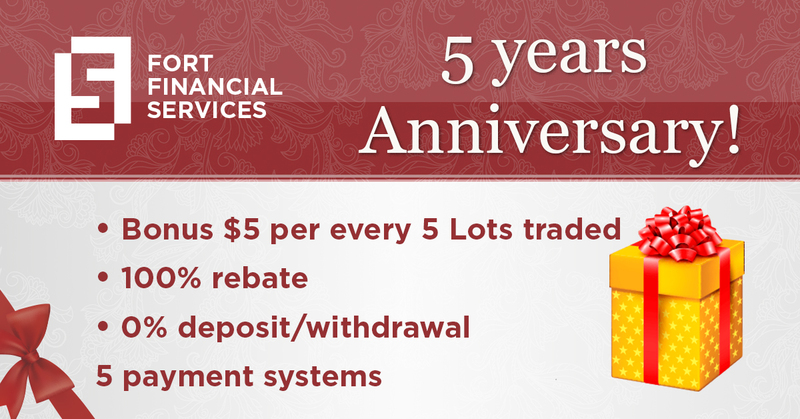 For every 5 cent lots traded, the account is credited with a bonus of 5 USD cents or equivalent in other currencies. REBATE 100% for the first 5 trades!